Mercantile Wharf is located at the intersection of Commercial Street and Atlantic Avenue. 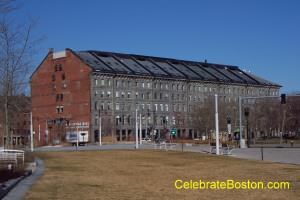 The wharf building was constructed in 1857, and was built as a storage warehouse to support nearby Quincy Market. Shipping related businesses originally occupied the upper floors, which included sail makers and riggers. The building actually bordered the waterfront at that time, and thus why it was named a wharf. Gridley Bryant was the architect, son of the builder of the Bunker Hill Monument. The north and south faces of Mercantile Wharf are of solid granite. The first floor has arched entrances, with a keystone atop each bay. The roof is very similar to its original design, and does not contain additional dormers or decks that have been added to many of the other re-built structures along the waterfront. A large fire in about 1970 gutted most of the interior of the structure. The building was completely renovated in 1976, with apartments located on the upper floors and stores occupying the first floor. An attractive open atrium or galleria, made possible by the fire and destruction of the roof, encompasses the center of the building, with skylights at the top providing natural light. The popularity and success of this renovation helped to save many other buildings from being demolished in Boston. They would have been replaced with bland high-rise apartment buildings, as manifested in the West End. For example, most of Broad Street contains the same buildings as it did in 1976, some of which were brick warehouses built in the time period or earlier. The stores at Mercantile Wharf cater mostly to North End residents, with a day care center, shipping store, cafe, florist, and a tour operator. This building is worth noticing as it is one of only a few buildings that very much resemble the waterfront structures of mid-nineteenth century Boston. About the photo above, from the late 1950s to 2005, the Central Artery elevated highway stood on the spot where this photo was taken, and completely obstructed the view of the building. Local commuters on the Central Artery can long remember zipping past the tops of these warehouses as they were only 30 feet or so away from the highway. Also related, in the 1910s and 20s, this area was known as The Dump because of the numerous warehouses located in a small congested area (I'm sure the horse-droppings did not help). Nearby attractions to Mercantile Wharf include the New England Aquarium, Quincy Market, Faneuil Hall, and TD Garden.